We had an opportunity to cook a few of the popular and traditional dishes of the Andean region. 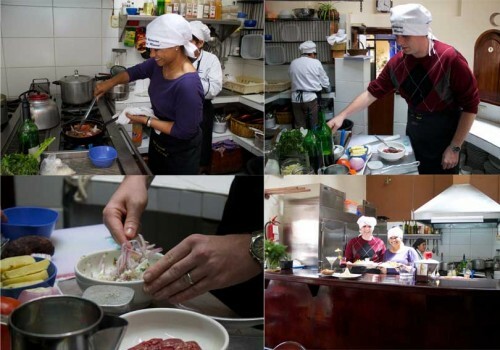 Through our hotel, Encantada, we booked a lunchtime cooking class for two for $100 (before tip, but this did include the lessons and the food). The restaurant is A Mi Manera, and it’s worth a visit even if you don’t take the cooking class. I started with my drink, the non-alcoholic chicha morada. The base was pre-made, and it’s created by boiling purple corn and chilling the resulting mixture. This made my part very simple: I cut up some pineapple, added juice from one juice, an ounce or so of simply sugar, and blended those with the purple corn juice in a blender. Ryan’s pisco sour was a bit more complicated, involving an egg white and alcohol, but the result was delicious! Once our drinks were prepared, we moved over to the kitchen to start the real work. The ingredients were already out and some of the early steps were pre-prepared for us. I went to work on one side and Ryan on the other. I started with the rocoto relleno (stuffed pepper) dish and Ryan with the cebiche. For my dish, I started with a mixture of egg, milk, and cheese, which would eventually by poured into a dish with my pepper and potato. I wish I knew what I stuffed the pepper with (it was pre-made by the chefs), but it was ground meat with veggies. The potato was already boiled, so I just had to peel the skin and place it in the dish alongside the stuffed pepper. Add a little sliced cheese on top, pour the egg/milk/cheese mixture in the dish, and it was done (well, after simmering on the stove and then baking in the oven). Ryan’s cebiche (the recipe is on the site), was made with the expected fish (he used pejerrey), red onion, hot peppers, limes, and cilantro. However, there was one surprise ingredient (missing on the recipe online): milk! Since Ryan made this dish first, the fish was able to sit in the acidic sauce and cook for the remainder of our class. The lomo saltado and quinoa atamalada recipes are also on the website. We had a lot of fun with this and we were able to mostly prepare it on our own (except for the rice and french fries). We even shaped the rice into a pyramid and half sphere! Ok, so we had some help with rice molds (here are a couple I’m thinking about ordering: pyramid and half sphere) – these were used for all dishes we ordered that came with a side of rice. We ended the class by sitting down to enjoy our food (the finished products are pictured above)! We dug right into the cebiche, which had already been sitting out for a good 20 minutes. Neither of us were brave enough to try the “tiger’s milk” (ok, I wasn’t feeling well, otherwise I definitely would have), but we did enjoy the spicy result of the fish. The quinoa was creamy, cheesy, and thick and perfect for a cool fall or winter day. The lomo saltado tasted like the ones we had in Ollantaytambo at the restaurant – I think this is definitely something we’ll be able to recreate at home with little difficulty. I do wish I had the details about the meat mixture that was stuffed inside the pepper. It was much more flavorful than any stuffed pepper I’ve ever made. I’m sure the Andean cheese on top helped that! I would highly recommend this class to anyone who enjoys cooking and learning about a new type of cuisine. 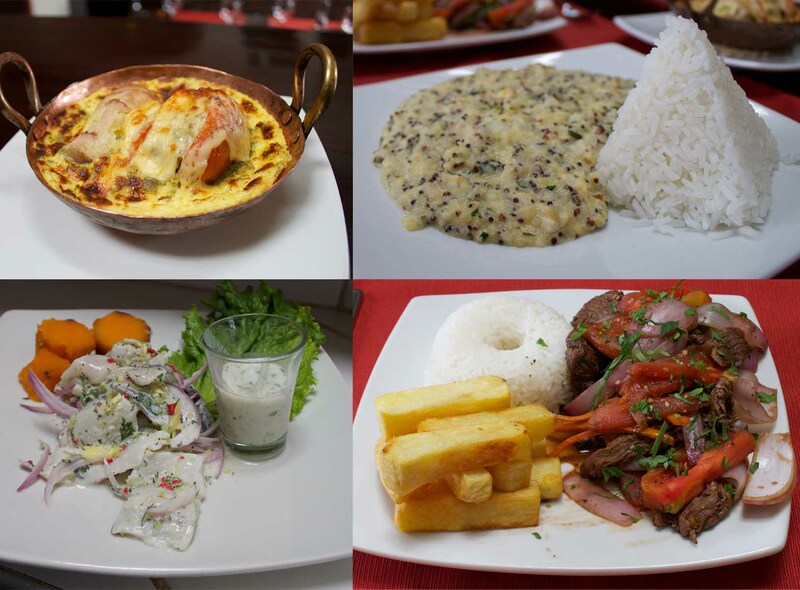 It made the Peruvian dishes seem less intimidating, and I’m excited to try a few of them out at home! Nati and her team were very sweet and helpful. This entry was posted in Food, Things To Do, Travel and tagged cooking, Cusco, food, Peru, Peru 2013 Trip, South America by Kristin. Bookmark the permalink.